Download or clone the AzureSignalR-sample GitHub repository. Subscription Choose your subscription Select the Azure subscription that you want to use to test SignalR. If your account has only one subscription, it is automatically selected and the Subscription drop-down isn't displayed. Pricing tier Free Currently there are Free and Standard options available. Create a new folder for your project. In this quickstart, the E:\Testing\chattest folder is used. Add a secret named Azure:SignalR:ConnectionString to Secret Manager. This secret will contain the connection string to access your SignalR Service resource. Azure:SignalR:ConnectionString is the default configuration key that SignalR looks for in order to establish a connection. Replace the value in the command below with the connection string for your SignalR Service resource. dotnet user-secrets set Azure:SignalR:ConnectionString "<Your connection string>"
This secret is accessed with the configuration API. A colon (:) works in the configuration name with the configuration API on all supported platforms, see Configuration by environment. By not passing a parameter to AddAzureSignalR(), this code uses the default configuration key, Azure:SignalR:ConnectionString, for the SignalR Service resource connection string. Copy the index.html file, and the css, and scripts folders from the wwwroot folder of the samples repository into your project's wwwroot folder. In the Filter by name... textbox, type the name of your resource group. The instructions for this quickstart used a resource group named SignalRTestResources. On your resource group in the result list, click ... then Delete resource group. In this quickstart, you've created a new Azure SignalR Service resource and used it with an ASP.NET Core Web app to push content updates in real time to multiple connected clients. 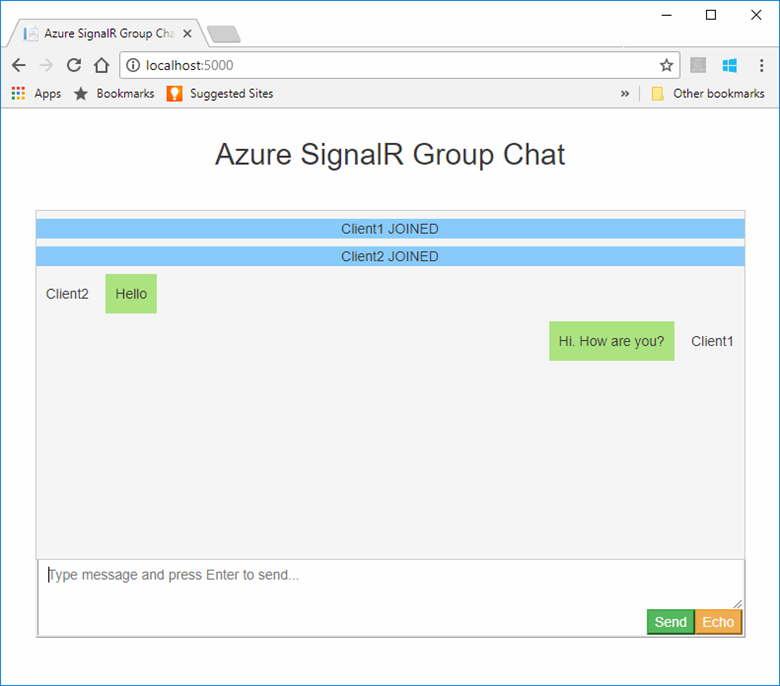 To learn more about using Azure SignalR Service, continue to the next tutorial that demonstrates authentication.